Sherbrooke mortgage rates are less competitive than many other cities. Nonetheless, these are the lowest rates from providers with offices in or near the city. For providers outside Sherbrooke, check the best rates in Quebec. Sherbrooke mortgage rates are moderately competitive versus other cities. These are the lowest rates from providers with offices in or near the city. For out-of-town providers check the best rates in Quebec. City in Brief: Sherbrooke is situated about 150 kilometres east of Montreal and is the sixth largest city in Quebec. 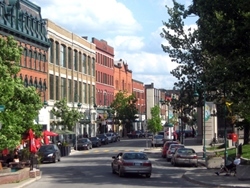 Sherbrooke’s economy has long been based on manufacturing but the service sector now plays an increasingly important role, as well as the city’s growing knowledge-based economy. The city is located near numerous mountains, lakes and rivers and as such attracts a large number of outdoor recreation tourists.